•M. Beretti and D. Stuart. Food Safety and Environmental Quality Impose Conflicting Demands on Central Coast Growers. California Agriculture 62(2):68-73. •Crohn, D.M. and M.L. Bianchi. 2008. Research Priorities for Coordinating Management of Food Safety and Water Quality. Journal of Environmental Quality 37(4):1411-1418. •Lowell, K., J. Langholz, and D. Stuart. 2010. 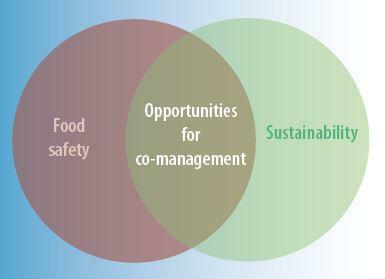 Safe and Sustainable: Co-Managing for Food Safety and Ecological Health in California’s Central Coast Region. San Francisco, CA. and Washington, D.C: The Nature Conservancy of California and the Georgetown University Produce Safety Project. An Initiative of The Pew Charitable Trusts at Georgetown University. See www.producesafetyproject.org for more information.